Study shows bat biodiversity in the Caribbean will take 8 million years to recover. Once biodiversity is lost, can it be recovered? A paper published in the journal Nature Ecology and Evolution, “Recent Extinctions Disturb Path to Equilibrium Diversity in Caribbean Bats,” by Luis Valente, Rampal S. Etienne, and Liliana M. Dávalos offers helpful new insight into this complex question. The researchers turned to islands to better understand the consequences of biodiversity loss. The study is based on the Island Equilibrium Theory of Biogeography, first introduced by Robert MacArthur of Princeton University and E.O. Wilson of Harvard. According to this theory, there is a relationship between the number of species that travel to an island and species on the island going extinct. The rate at which species populate and go extinct from an island depends on the type, size, and location of the island. Most islands start out with no species present but may be colonized over time. Species swim or fly to the island, and over time some of these species can undergo adaptive radiation–that is, branching out into more species (such as the Darwin’s finches did in the Galápagos). The theory states that the number of species on oceanic islands gradually increases until it reaches a diversity steady state, with no significant additions or losses. Scientists call this the dynamic equilibrium value. The greater Antilles, (including Cuba, Jamaica, Puerto Rico and Hispaniola) from which the researchers took samples from, are hotspots of island species diversity (home to many adaptive radiations – including the famous Anolis lizards). However, until now, scientists did not know whether these ecologically important islands were at equilibrium or not. Usually, the larger the island and the nearer the mainland, the higher the number of species present once equilibrium is reached. Biodiversity is the key to ecosystem resilience. Ecosystems with a wide variety of species have higher resistance to stressors, such as disease or climate change, than ecosystems with low biodiversity. The scientists examined samples from a fossil record of bats native to the Greater Antilles Islands of the Caribbean. The specimens included existing and extinct species. By examining the fossil record, the scientists were able to confirm that the bats had reached equilibrium diversity. This stable point was disturbed however, after humans colonized the Greater Antilles. Almost a third of island lineages disappeared, constituting a sharp downturn for bat diversity. These losses brought the number of bat species below their once-stable equilibrium value. The scientists performed calculations to answer a nerve-wracking question: How long would it take for nature to undo the damage humans had brought on? Insular species have evolved in isolation and have proved vulnerable to both Pleistocene climate change and human activities, including the introduction of non-native species, habitat destruction and exploitation…Over a third of (Caribbean bat) species and nearly a third of lineages went extinct from the (Greater Antilles) islands, probably as a consequence of human colonization. This study raises awareness for conservation of the unique bat species of the Caribbean that may have been overlooked by policy-makers. The extinction flare is becoming more and more difficult to ignore. 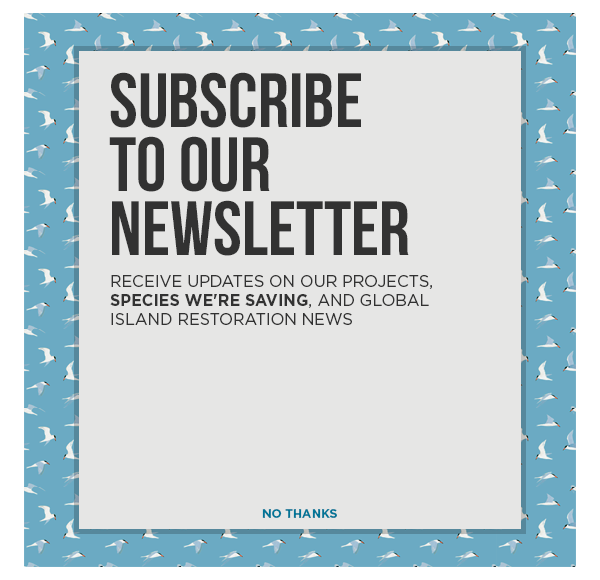 The news regularly reports growing concern for endangered species, warning us that animals around the world–with island species particularly at-risk–will disappear forever if we do not take action to protect them. Some people argue that if we leave nature ‘alone’ it will quickly return its original state. However, the finding that it would take 8 million years to recover lost diversity suggests that is clearly not the case. Organizations around the world are working hard to halt the erosion of biodiversity, including us here at Island Conservation. There is rarely a short-term action that has long-term benefits in conservation, but we’ve found one: invasive species removal. Invasive species are the leading cause of extinctions on islands around the world. By removing invasive species from islands, we can prevent extinctions and preserve biodiversity. It’s hard work, but it’s eight million times better than waiting around for nature’s self-corrective processes.